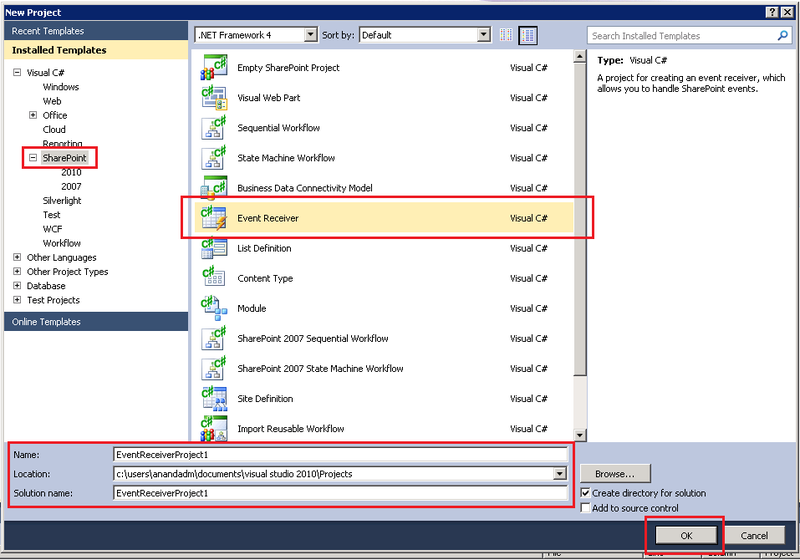 Under Installed templates, click SharePoint and then select Event Receiver (C# in my case). Enter the name, storage location and Solution name in the text box provided and click on OK. It will then ask you to specify the site and trust level or scope of your solution. If you want to deploy it across your farm so that all web applications can make use of it, you should select Deploy as Farm Solution. However, with event receivers, it is not usual so we will select Deploy as Sandboxed solution, which means it will only be accessible to the sites where we activate this feature. 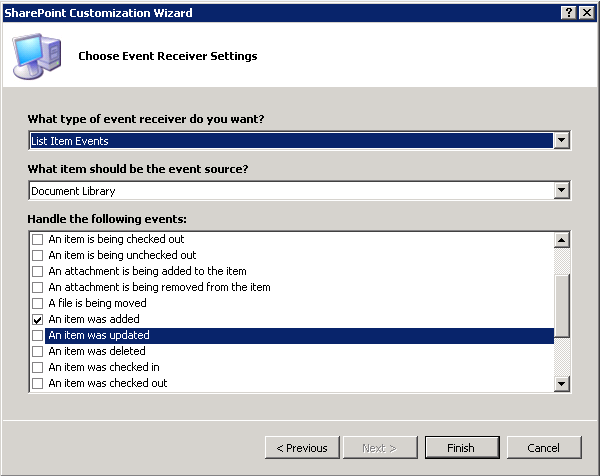 Now it will ask you to select the type of Event Receiver you would like to create. In our case it would be List Item Events. Then select what item should be the event source, here we will select Document Library as we want to create an item in document library and want our event receiver logic to run after that. You may want to select Picture library or a list here or as per your business scenario. Now, check the events you would want to code for within your receiver. For the sake of example, I will check An Item was Added which means it will automatically create a method stub for me with ItemAdded method. Now click on Finish. Our development IDE is ready to use now and you can see the method stub for ItemAdded being created already. Copy and Paste the code below to your solution. // Updating the ListItem to incorporate the change. Build the solution and deploy it. Go to your SharePoint site and activate it(if not already activated) and create any document library and create an item with Name as Test and see your event receiver in action. And write all your logic within your IF block. Add the IP in the Access mapping in SharePoint Central Admin. Select Alternate Access Mapping Collection as your team site. Add Internal URL as your IP and select zone as Intranet. While implementing intranet within our organization, we configure MySites within SharePoint, upload the user profiles from Active Directory and give users the ability to upload their own picture. Also, while implementing any News, or any company information, updates on the home page of Intranet, we tend to put pictures beside the text we write. Now, the image for several notifications can be of several size if you don’t have an in-house designer who trims/resizes your pictures to be uploaded to SharePoint. So, here comes my solution to resize images as we upload them to a definitive size which can then be uploaded and shown to users on the SharePoint. I have created Synchronous event receiver to my Notification list where I am adding the image and the code resizes the image and uploads it to the list for a nice and consistent look and feel of your website. Copy and paste the code below into your ItemAdded method. Let me know if you want to customize it more or have any queries. 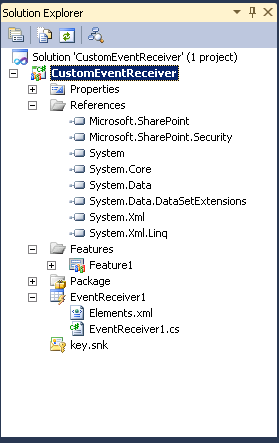 This is my first post on SharePoint 2013; dedicated to something I use the most within SharePoint implementations, the Event Receivers. As SharePoint 2013 offers App development as part of Office 365 development suite, which also replaces the traditional sandboxed solutions available in SharePoint 2010, it becomes very easy to create apps and maintain them within SharePoint 2013. I will write separately about how to create both of these event receivers in my future posts. In this blog I will explain what they are and how they can be used to suit our business needs. These event receivers signify events that occur on items within any list or library. Say addition of an item, update of an item or deletion of an item. They can be synchronous and asynchronous in nature. Microsoft has modified a bit in this version of SharePoint, the way we deal this nature of event receivers. We will see it how later in this post. These event receivers signify the events that occur to the app we are creating. Say app installation, app uninstalling or app upgrading. Like in SharePoint 2010, we had synchronous and asynchronous event receivers, in 2013; we have these two methods which deals with the nature of the event receivers. Many other things remains same the way we used to deal with them in SharePoint 2010 and VS 2010 environment like adding more events within your event receiver solution, changing the event receiver to point to either Document Library or an Announcement list and so on. I will write more as and when I try new things within SharePoint 2013. 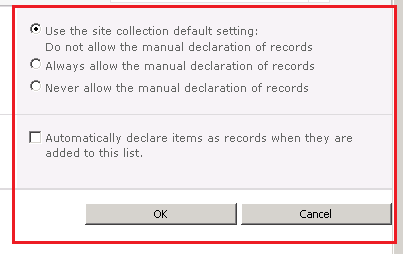 Record Declaration is one of the many new things introduced within SharePoint 2010. When implementing document management, we always come across scenarios where the final document is ready and we should lock it down so that no one can tamper with it and the document remains safe within the organization until it reaches its retention period. Such documents can be Staff files within an organization, any property related papers, insurance papers or so on. So, once we decide that the final version of any item within our SharePoint site is ready and we want to keep it for certain period of time without giving anyone the ability to change its content, we would prefer to lock it down and make it a RECORD. Record declaration can be done manually or can be done as part of the Information Management policy within the document library. We will see how to create any item as record in this blog post. 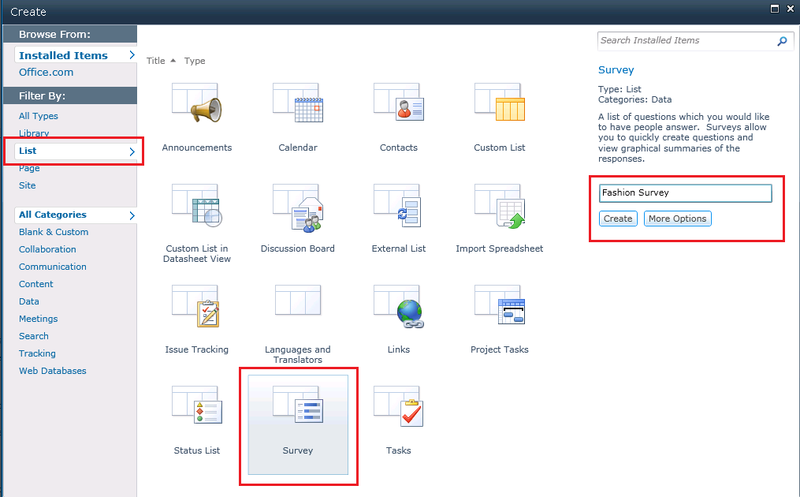 This will not allow users to declare the items as records manually from the ribbon button within the document library. This will introduce a ribbon button within the Document section (highlighted in the figure), clicking on this button will make the item as record and no more updates will be allowed on it any further. As name signifies, we cannot make the items as records by selecting this. Also, we see the check box for automatically declare items as records as they are added to the list, checking this check box will make the items are records with no functionality to update the item in the future. This is very useful as we deal with documents which have just one version i.e., the final version. Now we saw that either we can manually declare items as records which is very simple or we do it programmatically. But we can also declare records as part of the Information management policy within the document library. We can schedule the record declaration by enabling the retention on the items. 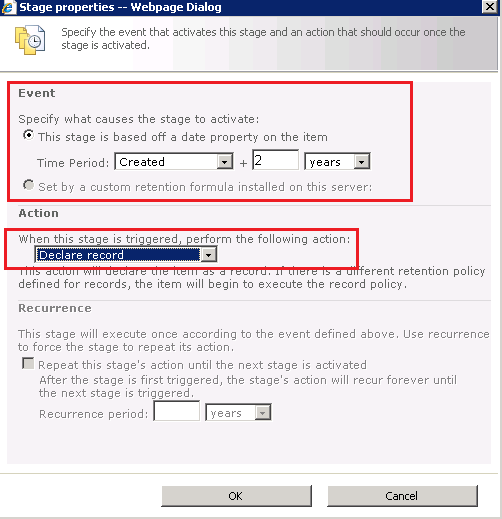 See Retention in SharePoint 2010 post for more details on how to implement retention to SharePoint items. 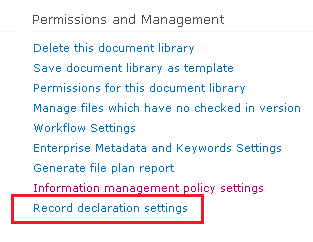 Click on Information management policy setting under Permissions and management in library settings. 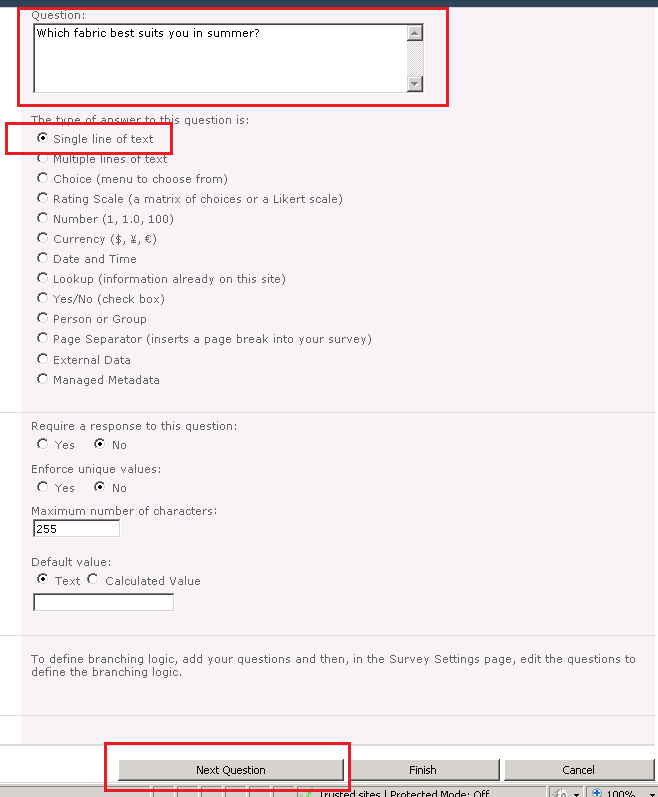 Click on the content type of the document, you want to declare records. Click Ok and save your retention schedule for the particular content type. Similarly, as we applied the rule on content types, the same can be done to the folders as well if you have folders in your library. SharePoint calculated columns often become very useful while doing simple or I should say not so complex calculations within SharePoint fields. I have had requirements which are not an easy one and not even so complex that I should be writing some kind of custom code to implement them, where I find the use of SharePoint calculated columns very useful. While implementing the calculations, I browsed many books, blogs and MSDN forums and found the below mentioned link very useful. I am sure this post will encourage you more to use SharePoint calculated columns where ever required as they are easy to implement and no maintenance required.